RESIDENTS and shopkeepers have spoken of their relief after councillors voted unanimously to turn down plans for Oxford’s third Tesco store. The supermarket giant wants to build an Express store on the site of the boarded-up Friar pub in Marston Road. But planning officers were against the plan because they said the two-storey building would impose on neighbouring properties, add to traffic problems along the road and delivery lorries could damage low-lying trees. Councillors at the north east area committee on Tuesday followed the recommendation and voted the scheme down. Councillor David Rundle said the committee should also reject the scheme because councils should be seen to support local pubs and it was hoped the Friar pub, which shut in 2006, would eventually reopen. After the meeting some of the 30 residents who attended spoke of their happiness at the decision. Jo Bartlett, from William Street, said: “It’s great news. “The place is a real accident blackspot so I’m glad it has been refused. Croft Road resident and community campaigner Mick Haines, 68, organised a 1,500 name petition against the store amid fears it would undercut local traders and threaten the only post office in the area at the Costcutters store in Old Marston Road. Sivanesarajah Pakeerathan , manager of the Costcutter store, added: “Places like Tesco are silent killers. But Jane Cox, added: “I wasn’t really that against Tesco. “But the old Friar pub is a beautiful art deco building. RESIDENTS concerned about plans to fill in a well-used subway are preparing to quiz council officials on Saturday. Plans for Oxfordshire County Council’s next stage of the £3m London Road improvement scheme will be on show at Headington Baptist Church from 12pm. The scheme includes plans to replace the Headington subway, which is adorned with hand-painted murals, with a pedestrian crossing. However, a campaign to save the concrete underpass is under way after County Hall claimed it was largely under used and people awere dodging traffic to cross the road instead. But residents who insist the subway must stay have hit back and labelled plans to fill it in a “ludicrous waste of money”. 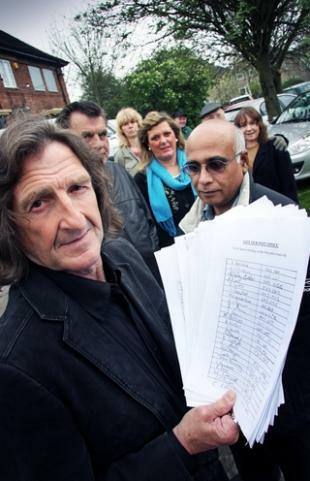 Community campaigner Mick Haines has collected more than 1,800 names on a petition. He said: “When they see how many people have signed, they will realise how much it means to the community. “I have been down there most weekends, talking to people and getting names on the petition. Older people, people with buggies and those who aren’t able to walk very quickly don’t want to have to rush using a crossing. Father-of-three Mike Ratcliffe, from Bickerton Road, added: “My children love the subway. County Hall said the London Road scheme, the first stage of which has already started, was designed to improve road safety and make bus journeys quicker and more reliable by giving them priority at traffic lights near the Co-op store. The authority intends to revamp the main Headington shopping area and resurface pavements. The first stage of work, between Pullens Lane and Osler Road, is still under way and due to be completed by May. The next stage of the work, in Headington centre, is due to start early next year. Plans go on show at Headington Baptist Church, Old High Street, tomorrow between noon and 8pm, and on Saturday between 10am and 3pm.